Usually when a story begins with “a pack of 13-year-old boys,” you are prepared to shake your head in disgust at the story about to unfold. But in this case, you better break out the tissues because in New Jersey we find a story that will renew your faith in man. The media often focus on the worst examples of humanity out there. But this time we get a heart-warmer after the story of 13-year-old Gavin Maves of South Brunswick, New Jersey, began going viral. 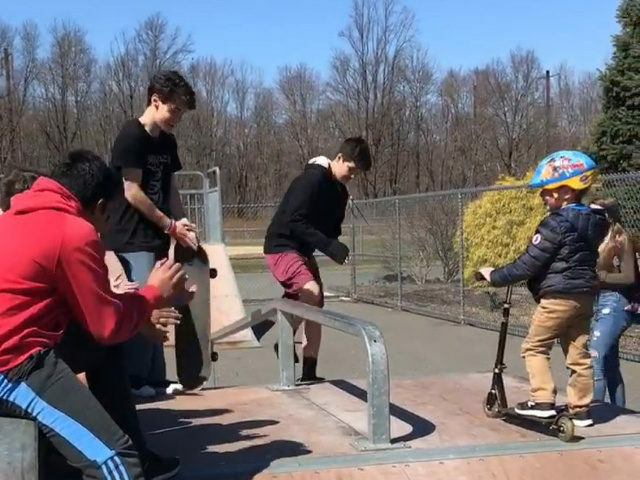 Last Tuesday, Kristen Braconi brought her autistic son Carter to a local South Brunswick skate park to celebrate his fifth birthday. But when the protective mother saw a band of 13-year-old boys running into the park, she was alarmed and prepared to whisk her vulnerable little one right out of the place. “The bigger kids started showing up, and Carter kind of said, ‘Oh no,’ and he thought he was going to have to leave, because, you know, he’s little, and he thinks that bigger kids don’t always want to play with little kids,” Braconi told the media. But instead of starting trouble, young Gavin approached little Carter and began playing with him, helping him use his little scooter, and letting the boy try out the older kids’ skateboards. Soon, the whole band of boys was laughing and palling around with little Carter as if he were king of the park, and at one point, even broke out singing “Happy Birthday” to the small boy. And Carter’s mom caught the whole thing on video. Barconi said she was overwhelmed by what the boys did for her son and shared her videos to her Facebook account. The videos quickly went viral. “It’s hard to teach kindness. It’s something that you can’t teach, you just hope that you convey the message, and it keeps going,” the grateful mother said. It was not long before the whole town of South Brunswick came together to celebrate little Carter’s birthday and to praise the band of 13-year-old boys who performed such a selfless act of kindness. The South Brunswick police even got involved and threw the kids a pizza party in recognition of their good citizenship.